PHOENIX, Arizona – CBRE arranged $22.8 million ($120 PSF) in debt financing for the recent acquisition of Missouri Falls, a class A office building in Phoenix. Dana Summers, Bruce Francis, Shaun Moothart, Bob Ybarra and Doug Birrell of CBRE’s Debt and Structured Finance team arranged the 10-year full-term interest only loan for the buyer, El Dorado Holdings, Inc., an Arizona-based real estate development and investment company, who purchased the property for $41.4 million. 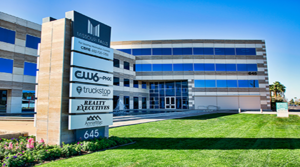 Located at 645 E. Missouri Avenue, the 190,419-square-foot office building recently underwent a $10 million renovation and features open floorplans, kitchens and extensive window walls. 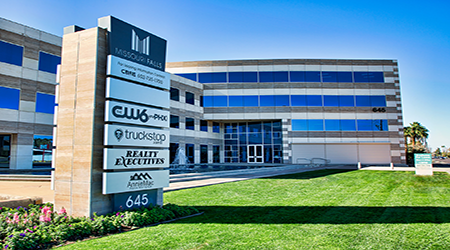 The property was 87 percent leased at the time of sale, and tenants include Envision Healthcare, Citizens Bank, Realty Executives, National Marketing Service, Republic Bank of Arizona and Nexstar Broadcasting Group. “Our Debt & Structured Finance team was able to leverage our longstanding relationship with a Wall Street firm we’ve done business with for two decades and hence provide the client with the absolute best available pricing, unmatched in the market,” said Summers. The property sits in a mature infill location with high barriers to entry. The market presents strong demographics with more than 400,000 residents within a five-mile radius. Located at the juncture of the Camelback Corridor and Piestewa Peak submarkets, the building sits in an amenity-rich, urban environment. The Phoenix office market continues to perform well as healthy tenant demand resulted in a significant amount of net absorption, leading to a decrease in vacancy throughout the year, according to CBRE research. Employment growth in the Phoenix market has driven demand for office space, particularly among users in financial and technology industries. The economic outlook remains positive through the remainder of 2018—tenants will continue to search the market for quality space and walkability to amenities and restaurants.